...So let's give cheese a chance and err on the more delicious pro-cheese side. In addition to being loaded with calcium and vitamin D, cheese contains lots of great vitamins that benefit your body in some surprising ways. New research comes out on a nearly daily basis, and more and more point to the healthful qualities of cheese. 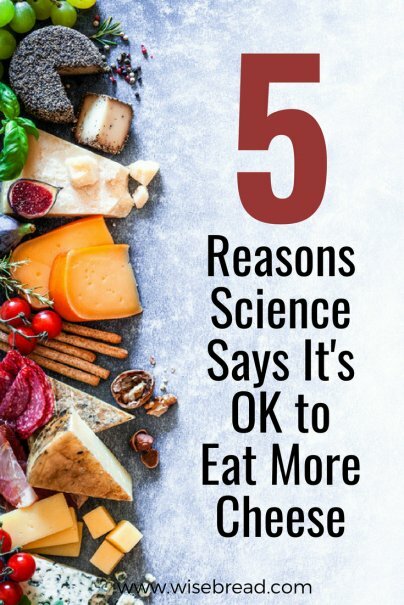 Just keep a few things in mind while you nibble on that block of cheddar: eat good quality cheese (organic is best), watch your portion sizes, and eat other healthy foods to round out your diet and keep calorie intake at recommended levels. We also suggest eating a cheesy snack while reading the following facts. Because it's high in protein, cheese can increase your metabolism for a short period of time after eating. A 2013 study also found that dairy contains a fatty acid that's been shown to have health-promoting effects on metabolic health. A Canadian study in 2014 found that dairy intake is associated with a reduced risk of developing type 2 diabetes, showing a positive metabolic impact. All great news for cheese lovers. As weird as it sounds, cheese is good for your dental health. In addition to containing calcium, which is great for bone health, consuming cheese and other dairy products may help protect against cavities. A study in 2013 compared the pH level in subjects' mouths before and after consuming dairy — a low pH puts a person at risk for tooth erosion. The group that ate cheese showed a rapid increase in pH levels, suggesting that cheese could have anti-cavity properties. Cheese was already a better snack choice for dental health than carb-filled or sugary snacks, and now it's even better. Not only will cheese make your tastebuds really happy, it'll keep your teeth smile-worthy, too. French people eat a lot more cheese than Americans on average, and yet they typically have low rates of coronary heart disease. This "French paradox" has long confused scientists, since current logic tells us that all of that saturated fat can lead to real heart problems. Clearly there is something else going on, and new studies are beginning to shed light on the subject. A recent Danish study showed that a diet including cheese may have a positive effect on gut bacteria, which in turn affects lipids in the blood. Further research could lead to a new understanding about what affects cheese has on the body and how the body processes it, changing how we view cheese products. As you are most likely aware, dairy is a good way to get the majority of your calcium intake. Calcium is essential to bone health, as is vitamin D. Cheese is an especially good source of both of these vitamins — two slices of Swiss cheese contain a whopping 44% of your recommended daily calcium intake. Cheese also contains vitamins K2 and D3, and when consumed along with calcium, they are especially powerful for protecting your brain, heart, and bones. Vitamin K2 helps transport calcium into the proper areas of the body like your bones and teeth, and helps keep it from being deposited where it shouldn't, like arteries. This may seem obvious by now, but it's worth pointing out that cheese can and should be part of a healthy diet. It's a great source of protein, which helps fill you up and gives you energy. Cheese is high in calcium, phosphorus, vitamin A, and zinc, all of which are necessary for a healthy lifestyle. Most cheese products are gluten-free and low in lactose, making them safe to eat for most lactose-intolerant people. While some are higher in sodium than others, none contain nearly as much sodium as many processed foods, making them a healthier snack. So sprinkle a little cheese on your salad or pasta, or enjoy a small plate of cheese and whole wheat crackers — it's good for you. What's your favorite healthful cheese? Our first pediatric dentist suggested cheese as a snack vs. crackers (which get stuck in the grooves of teeth). So my kids have grown up knowing that they can always grab a piece of cheese if they need a quick snack. I love cheese. Every week when grocery shopping I spend $10-$20 on some of the more elegant cheeses. It's my little splurge. It should be added too that the latest research shows cheese is a great addition to your diet, but aged cheeses are better than others. And whatever you do, stay away from American "cheese".